It’s right there, in the heart of the magical ancient woodland in the province of Småland: Eksjö. There are unique environments steeped in cultural history for you to discover throughout the municipality, but the most unique attraction is the wooden town with its architecture that spans more than four centuries. Enter into a cultural treasure trove that has risen from the ashes of two town fires and that contains nearly 60 listed historic buildings. 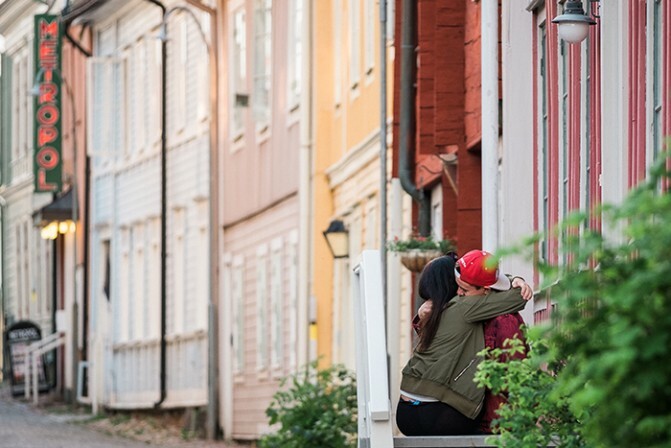 In the old town Gamla Stan and on the squares Stora Torget and Lilla Torget, you will find environments that are reminiscent of the commerce, high society life, tranquillity and everyday activities of days gone by. Be fascinated by the old trading stores and burghers’ residences, such as Aschanska Gården, be impressed by the town’s 18th century church and the historic town hall, Rådhuset, which is now a town hotel. Go for a stroll and let your imagination transport you back to the late Middle Ages and the neoclassicism of the 19th century. The history of the wooden town runs through all these centuries. If only we had a time machine and could travel back to experience it all! Eksjö hosts many concerts, markets and other events, during which the wooden town often provides an atmospheric backdrop. However, it is never just an extra; simply by being there it always plays the leading role.